What Are the Best Examples You Have Seen of Teachers Using Social Media to Enhance Learning? I have heard people blaming school to be an island isolated from external world. However, the world is breaking into the schools in real time, thanks to smart phones which can be found in almost every student’s pocket. If a media-critical-adult is experiencing information as overloaded and overwhelmed by a flood of news, what happens to the child? A tricky challenge for the current school is how to teach a child to read the media. In Finland, the school is not alone with this challenge. 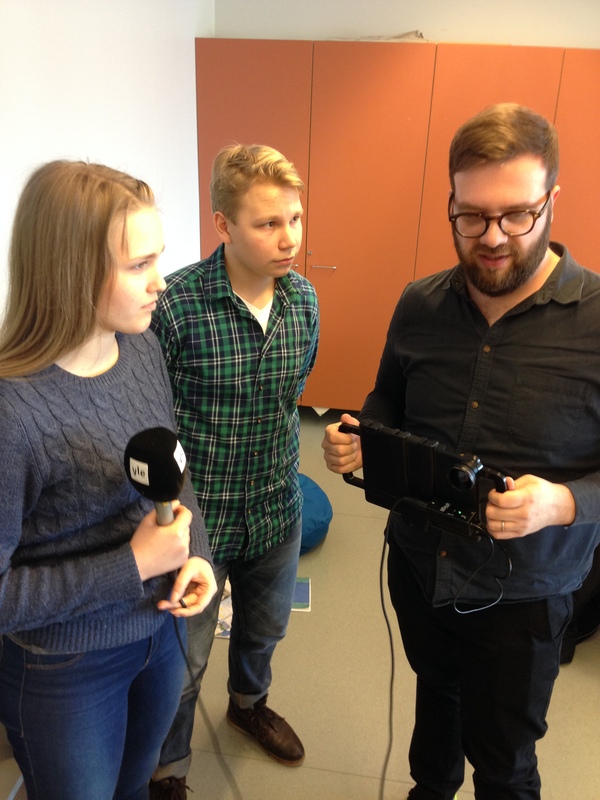 We have an education partner YLE (Finnish Broadcasting Company) News Class – media education project, where students practice journalist work under the guidance of professional journalists. This co-operation benefits all parties. Teachers will get diverse teaching material for the media teaching and the students learn real media work. And YLE will get a new dimension to their operations, the young people’s perspective of the world’s phenomena. Finnish teachers also have an access, first in the world, to use the free YLE News Class Triplet service which produces teaching material to classes every weekday morning. This service is intended for primary and secondary schools. My colleague Jaana Lindfors from Kirkkoharju school collaborates News Class now for the second year. Lindfors can’t think of a better way to teach media literacy as letting the young people make News stories themselves. This operation has made her students social influencers. Last year was an election year in Finland and the students were right in the heart of policy making – with the help of YLE. The Prime Minister and Minister of Defence took part in Kirkkoharju News Class election interview. Also Mr President was interviewed. The open-minded questions of the young students brought a refreshing perspective to stagnated political jargon. The interviews were published on YLE website and TV broadcast, and they got glowing comments in social network. This year Kirkkoharju School’s News Class will make a radio program which they have brainstormed together. When it was announced that I’m one of the top 10 finalists in Global Teacher Prize competition, Hanna Visala the news class producer from YLE knew right away that Kirkkoharju school is ready for action. News Class members Pihla Jokinen and Leo-Pauli Moisio were sent to Kartanonranta school to make a story. The 9-graders interviewed my 6-graders and as a result a News insert was ready to be published in YLE website (http://areena.yle.fi/1-3341820).This News Story is an excellent example that the students can learn the media activities also from each other. News Class members Pihla Jokinen and Leo-Pauli Moisio are ready to interview my 6-graders with Mikko Laine from YLE, photo: Hanna Visala. The News Class will actively utilize social media. They know that information sharing is contemporary culture rather than pledging information. It is possible to learn to read the media and enjoy it. The 26th of April is the News Class day and on that day, the news graders are strongly present in the national and social network. By this blog post I want to encourage teachers to open the doors and look for partners. By reading this you are utilizing social media and if you are interested to know more, please follow the News Class events at #uutisluokka. http://marketing.pathstomath.com/wp-content/uploads/2013/04/paths_to_math_logo_340x156.png 0 0 Maarit Rossi http://marketing.pathstomath.com/wp-content/uploads/2013/04/paths_to_math_logo_340x156.png Maarit Rossi2016-04-14 14:32:392016-04-22 08:20:21What Are the Best Examples You Have Seen of Teachers Using Social Media to Enhance Learning? What is the reason that most students think that math is only memorizing and practicing endless list of formulas? Earlier and sometimes even today schools put too much attention to mechanical practice. I agree that you have to have routine in math which you can get only by practicing. We need to have perseverance so that we don’t give up too easily. Individual questions, applications, quizzes and tests are important, but if that is building the only learning environment, the mathematics is too far from student interest and life. Successful Math pedagogy is a question of balance. Instead of having the same structure for each lesson, lessons should include Learning by Doing, Social Learning, Interdisciplinary Math and Practice. With different approaches teacher can support and develop such skills as critical thinking, problem solving and decision making. As a teacher I know that students love to work together face by face but they also want to practice alone their personal skills with different technology approaches. Teamwork can be best practiced when you are a member of the group. When you want to find the routine or sharpen your skills, then you may want to work alone and the technology can lead you longer in your skills than you ever thought. Learning is a personal, nuanced and complex human activity – and there’s need for multiple paths and approaches. Math is not a list of rules to be remembered. Math is a tool to look at the world that really makes sense. Math is not anymore boring but challenging, stimulating and even FUN.